Note: All legacy software is offered on an "as is" basis, with no guarantees or support. Cloud Generator synthesizes granular sounds in units called "clouds" and also "granulates" stereo sound files. The program uses the AIFF file format. The program, developed by Alberto de Campo and Curtis Roads, generates sound particles called pulsars. 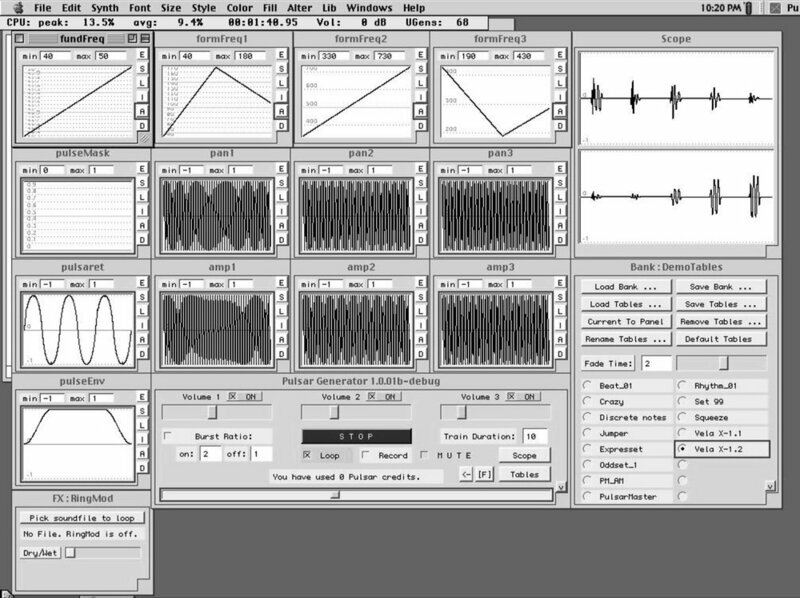 The theory of pulsar synthesis is explained in the March 2001 issue of the Journal of the Audio Engineering Society. EmissionControl (EC) is a prototype granulation program written by David Thall (MS, Media Arts and Technology, UCSB 2005, updated 2008) in consultation with Curtis Roads. EC is an interactive real-time program for granular synthesis and sound file granulation, with many novel features, including modulation of synthesis parameters, multiple sound file input, and variable-Q filtering on a grain-by-grain basis.